© Emerald Group Publishing Limited 2006. Purpose – The purpose of this paper is to investigate the motivators for Taiwanese students to study higher education in a western society. 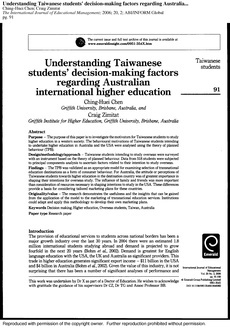 The behavioural motivations of Taiwanese students intending to undertake higher education in Australia and the USA were analysed using the theory of planned behaviour (TPB). Design/methodology/approach – Taiwanese students intending to study overseas were surveyed with an instrument based on the theory of planned behaviour. Data from 518 students were subjected to principal components analysis to ascertain factors related to their intention to study overseas. Findings – The TPB was validated as an appropriate model for examining selection of transnational education destinations as a form of consumer behaviour. For Australia, the attitude or perceptions of Taiwanese students towards higher education in the destination country was of greatest importance in shaping their intentions for overseas study. The influence of family and friends was more important than consideration of resources necessary in shaping intentions to study in the USA. These differences provide a basis for considering tailored marketing plans for these countries. Originality/value – The research demonstrates the usefulness and the insights that can be gained from the application of the model to the marketing of transnational education services. Institutions could adapt and apply this methodology to develop their own marketing plans.